British rock group Suede - one of the defining bands of the mid-1990s Britpop scene - played their final gig on Saturday at the Astoria in London. The band announced their decision to split up in November, shortly after the release of a greatest hits album. 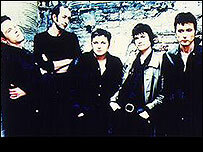 Along with Oasis and Blur, the band - led by Brett Anderson - shot to fame in the early 1990s. Hit singles included Metal Mickey and Animal Nitrate. But the last few years has seen a downturn in their popularity. Following the initial announcement, Anderson explained the reasons behind the split on Suede's official website. "This decision was based purely on creative reasons," he said. "There has been speculation about record sales and chart positions, but the bottom line is I need to do whatever it takes to get my demon back." "You should all know we will remain good friends and that I can genuinely see us working together again." "What we have done has been too special to just throw away." The band were at the forefront of the Britpop scene that dominated the British charts in the 1990s. Their debut album, 1993's Suede, was widely hailed as a classic, as was the follow up, 1994's Dog Man Star. The band continued to enjoy success, despite the acrimonious departure of guitarist Bernard Butler. But the 2002 album A New Morning only reached number 24 in the charts, prompting speculation that a split was imminent. Saturday's concert followed a week of farewell appearances in Glasgow, Manchester, Bristol and Birmingham. Have you seen one of Suede's farewell concerts? How do you feel about their split? Send us your views and tributes. Have great memories from 10 years of going to see Suede live, a fantastic band that produced beautiful albums which I shall still be listening to in years to come. There is no one else like them. Saw them at the Astoria on Saturday night, what an experience! Very sad that this was both my first and last time seeing them. I was at Brixton on Friday, and it was simultaneously one of the most heart-breaking and life-affirming events in my life. They proved that quality always triumphs over rhetoric. Bernard who? The problem with Suede was not a lapse into self-parody, but rather when they refused to just do the same thing over and over, and attempted a new direction on A New Morning, nobody wanted it: see also what happened to Pulp. Who the hell are Suede, anyway? Since I'm from Israel I couldn't really go to their final shows in the UK, but I did go to their amazing gig here in Israel 3 years ago. In Israel Suede are even more popular than Blur or even Oasis. So it's sad that the special band had to split. They mean so much to me and to their loyal fans: they were, they are and always will be the soundtrack of our lives. Saw them at Brixton last night, which is where I first saw them in May 1993. Suede were the first band to matter to me and are still the band that matter most. Suede was my first proper gig (I had to go to hospital the next day because of severe bruising from being crushed against the front barrier by the crowd!) and will be my last proper gig - at the age I am now there is no other band that will inspire me to push my way to the front and sing and jump for two hours solid. I understand the reasons for the split and think they are good ones. However, that doesn't stop me feeling immeasurably sad. See you in the next life. Short and sweet. Disappointed that this concert will close the door on the creativity of a great band. Annoyed that they felt they had no choice but to cancel their Belfast concert on the 5th Dec, which effectively ruled out any chance of their N Irish fans having a chance to see them live one last time. I saw Suede in Glasgow and it was truly awful. I've seen them 10 times since the early days of The Drowners and I can't believe how bad they become. Brett's voice has gone and they have made the right decision. If they do reform it MUST be with Bernard. Just come back from Brixton - awesome - gig of the year for me. They played everything I could have wished to hear... can't wait for the last one tomorrow. I'll miss you guys - I love all the albums - quit while you're ahead (at least in my eyes). I saw Suede at Manchester this month and they were fantastic - truly one of the best bands I have ever seen. Brett proved himself to be a fantastic, energetic front man and the crowd were going wild. Although it is a shame that the band have split up, it was obvious that they had past their peak. They got far more response off their early tracks from the crowd. Their Singles CD shows that at their best they were fantastic, but in the end were repeating themselves. I saw the Bristol gig on the farewell tour and the amount that they played from Dog Man Star seemed to be an admission that it was their best record. But for all the talk of an amicable split, Brett hardly spoke to the crowd which was out of character. Anyway, I'll miss them as they were one of my favourite bands of the 90s and early 00s... but they should have split one album earlier. They were always a terrible band producing dreadfully tepid music for a generation of shoe gazing students. They lacked the ability to evolve like many of their "britpop" peers and Oasis should take note. The world will be a better place without them. Really, Suede ought to have split in 1994, when Bernard Butler left the band. Or at least, they shouldn't have tried to carry on under the same name. Their output since Dog Man Star has been consistently good, but never great, and it's always sad to see a once-great band drifting into self-parody (you can see it now with Primal Scream). At least when John Squire left The Stone Roses (the best British band of the past 20 years, in my opinion), Ian Brown and Mani realised pretty quickly that no one would accept them carrying on under the same name and pretending the much-loved old band was still a going concern (it's true that they attempted to continue without Squire, but this attempt lasted only a few weeks). It's amazing that the post-Butler Suede lasted as long as it did, but they're probably right in calling it a day now. If Anderson feels the creative fire's gone out, he's probably correct. I am very sad that they have split, but I am angry at them for cancelling their Belfast gig! My friend bought us tickets as a Christmas treat, but two days after the split announcement - where they stated that they would still tour - the Belfast concert was cancelled. So Suede, I'm sorry you'll no longer be making excellent music, but I'm still miffed! Saw them at Bristol Academy this week - Anderson is a great writer/performer - I'm sure we'll be seeing more from him.